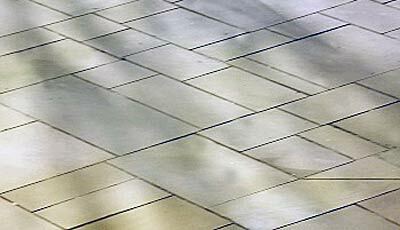 Sawn yorkstone paving has a smooth surface, much different to the uneven and rough finish of riven paving. 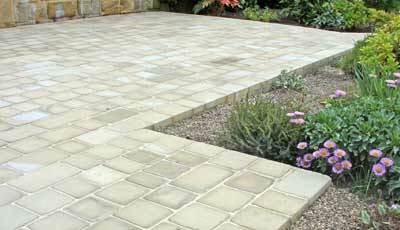 It is ideal as a paving stone for footpaths, patios and gardens. 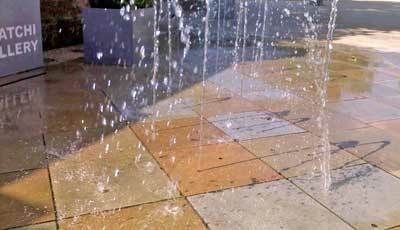 It is also widely used indoors, and yorkstone flooring for kitchens and living areas is increasingly popular. Our sawn sandstone paving can be used with its natural look or it can be varnished or stained to give it a shiny surface or wet look. The sandstone slabs are sawn on all six sides from large yorkstone blocks with a diamond blade saw and are then honed and polished to a smooth finish. 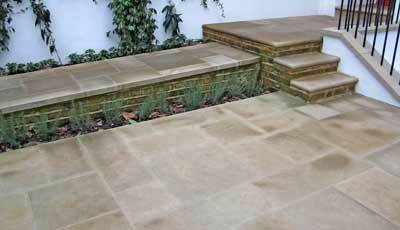 To find out more about sawn Yorkshire paving sandstone and to see how it is made see our article on making sawn paving. I just wanted to drop a line to say thank you so very much for the beautiful yorkstone that you supplied for our porch in Oxford. I would have absolutely no hesitation in recommending you. Tumbled yorkstone setts are sawn yorkstone blocks which are 'tumbled' to give the appearance of the old setts or cobbles still seen in some northern towns. They are cut to a standard width and thickness but lengths are random. They are widely used around the home as driveway cobbles, cobbled paving, patio cobbles and garden cobbles. 150mm x random length x 50mm thickness per square metre, palleted.